Project CrossTime is a 1996 Mazda Miata purchased for $1,000. With 187,000 miles on the odometer, you would think it is time for the retirement home. However, instead of letting it go quietly into that good night, we plan to build it on a budget — over time — to prove that you don’t have to have a lot of money (or experience) to go racing. Starting with a virtually stock Miata, we will slowly transform this nimble little convertible into a track-day racer that can create havoc for high-dollar sports cars. CrossTime was bought as a nod to the RPM Act (if you don’t know what it is, Google it now!) — taking a street car and turning it into a dedicated track car. The object was to take it from stock to a budget-minded race car, then eventually, maybe go crazy with it and throw a bunch more power at it. It is said the word “miata” is derived from an old German word meaning reward. The Miata is the best-selling two-seat convertible sports car in history — and probably the most-raced car in America, if not the world. Mazda has made millions of Miatas through the years, so there are a ton of them out there to be had for cheap. Parts are cheap too, and there are plenty of aftermarket companies supplying performance goods. We think it makes great sense to have a Miata as a project car for TURNology. The project name CrossTime is an amalgamation of the words autocross and time trial. Readers can follow along as we start to throw parts on CrossTime to increase lap times making it into an awesome corner-carving Autocross and Time Trial beast on a budget. We hope you will be rewarded with ideas you can use on your project. This build-thread article will be a “quick hits” summary of our longer-form articles to keep you up-to-date on how the project is progressing. You will be able to click the links within this article to get to the more detailed articles on specific parts of the project. Ride along with us as we take a street car and make it into a (hopefully) worthy, competitive autocross and time trial car. The Racepak Vantage CL1 is a nifty little data acquisition system for the track day and autocross enthusiast. After running at the track for the first year, it was time to start acquiring some data on how I was performing on the track. Were setup changes helping or hurting? Was I a good driver or a bad driver? I had nothing to judge myself against other than how I was doing compared to other Miatas on the track. Even then, they probably didn’t have the same setup I had, so it was time to dive into data acquisition to see if I was progressing. After doing some research on different systems on the market, I decided on the Racepak Vantage CL1 for its low-price, real-time data, predictive lap times, portability, and autocross functionality. I’ve used the Vantage for several months now and really like the ease-of-use of the system. There is no complicated software to have to learn and the data is right there on your phone. You can analyze your runs as soon as you are done with you session. Another cool aspect is that you can give others your team information, and if they download the D3 app, they can watch your runs in real time! The Racepak Vantage CL1 has become a great tool in my arsenal. Read the whole article to see what the advantages are and how I use it at track day and autocross events! Our new SPEC Clutch and Flywheel assembly came ready to roll with the pilot bearing, throwout bearing, and an installation tool. I managed to make it through the whole season without a drivetrain failure. That’s pretty impressive seeing Project CrossTime has 188,000 miles on the odometer. But as the end of the season approached, the clutch showed signs of being the first part to give up the ghost. It would chatter extremely bad when engaging it from a stop and I ended up having to quit my last session early as the transmission started to “chunk” into every gear. The clutch was no longer fully disengaging even though I was pushing the pedal all the way to the floor. This is what greeted us on the inside of the bellhousing when we took it out. The mystery was solved once we got to the clutch. Can you believe it was still working??!! I turned to the pros at SPEC Clutches and Flywheels for a replacement — but not just any old replacement. Nope, after some discussion with owner David Norton, he suggested I go with a SPEC Stage 4 clutch assembly for a 1.6-liter Miata and mate it to a billet-aluminum flywheel for the lightest combonation. 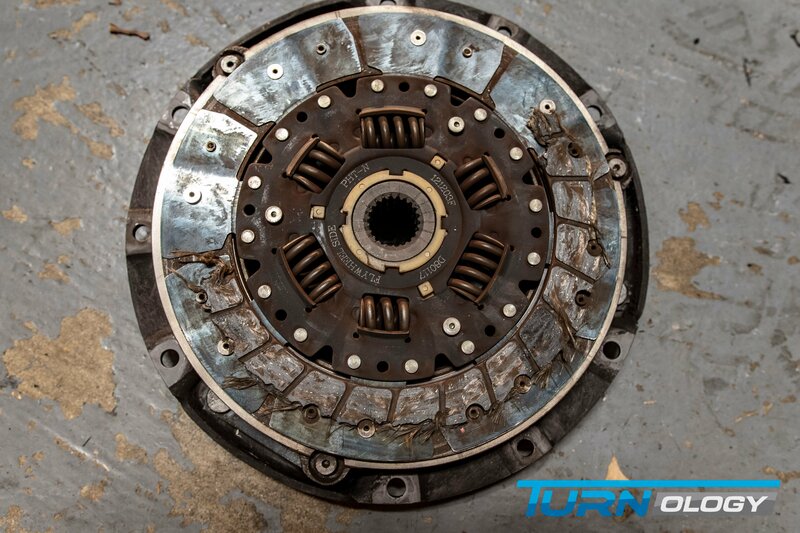 The Stage 4 is a three-puck, solid-hub clutch; definitely not for street use, but perfect for the little track Miata. Before I made the switch, I asked David how to best show the benefits of the upgrade. He said “dyno,” so that is exactly what I did! I took Project CrossTime to Bailey’s Auto And Exhaust in Pontotoc, Mississippi, and put it on a Dynojet to get before/after dyno numbers. To say I was impressed by the upgrade is an understatement. Check out the dyno video, my driving impressions, and dyno results HERE! Part Three of our safety series focuses on the safety measures I made on the car itself to keep me safe while on-track: rollcage, seat, quick-release steering wheel, and 6-point camlock harness set. Once again, I turned to the pros at RaceQuip and Summit Racing Equipment the gear, while I turned to Steve Gurley at Racefab Performance in Covington, Tennessee, to build a Spec Miata cage. Although I’m not racing door-to-door, I will be doing Time Trial races where passing will be made with a point-by. Anything can happen while on the track, especially when other cars are involved, so Steve convinced me to go with a full-on Spec Miata cage. It would also help if I ever decided to sell the car. The MOMO Super Cup racing seat from Summit Racing fits perfect in the little Miata (although we did need to do some slight hammering on the tunnel). The seat is solid mounted to the floor and Steve also fabbed up a back brace to connect it to the harness bar. Also, from Summit, I got a JOES Racing quick-release for the MOMO MOD 30 steering wheel. The wheel is slightly smaller than the stock wheel, but has ergonomic grips and a flat bottom to give me knees some extra room. The final piece of the puzzle was a 6-Point Camlock Harness Set from RaceQuip. This harness is made with 2-inch reliefs on the shoulder straps to fit into the grooves on the HANS device and really keeps me locked down in the car. The camlock is super easy to get unlocked quickly in case I need to make a quick exit. Though I didn’t originally plan on this being a four-part series, look for a part four coming soon on some final “bonus” safety measures we’ll put on the car. Roger at RaceQuip noticed I didn’t have a fire retardant shifter boot or a passenger-side net (good to have if you don’t have a “halo”-style seat). I will also be installing a kill switch from Flaming River and a fire suppression system from Lifeline. CrossTime is turning into a racecar going into the 2019 season! This is part two in our safety articles on our $1,000 Miata. It concentrates on the items I will be wearing while in the car to protect myself on the track. The majority of my gear came from RaceQuip. It specializes in making value-priced SFI-rated suits, shoes, gloves, harnesses, nets, and restraints. I had already purchased a Snell SA-rated helmet from RaceQuip, so I just needed to round out my gear. I got a Chevron-1 suit, gloves, shoes, underwear, socks, hood, and arm restraints to complete my ensemble. I also turned to our friends at Summit Racing Equipment for a HANS Pro Ultra-lite device. The number one thing to keep in mind with safety equipment is price doesn’t always mean a difference in quality. In order for a product to carry an SFI, FIA, or Snell SA certification, it must meet the requirements of those organizations — regardless of price. If it doesn’t meet those requirements, it doesn’t get the certification sticker. And if it doesn’t have the sticker, chances are the racing sanctioning body isn’t going to recognize it as safe and won’t let you run with it. I splurged on a couple of items that I could’ve gotten away with going cheaper in price, but all-in for all the items I will be wearing, I spent $1,293.60. You could easily get that amount to under $1,000. Read my impressions on the products I got to keep me safe and stay tuned for part three where I discuss what I did to the car to keep me safe! This crash really got me thinking I better get serious about safety. He was ok, because he was prepared. Though this article is really more of an editorial, it outlines the start of a three part series on the safety measures we are employing on CrossTime to keep the driver (me) safe on the track. Like many others, I bought the car then headed straight to the track. Ok, I did install a rollbar, but other than that I did not address safety from the very beginning like I should have. As things often go, things kept me from starting on it. So, with some not-so-subtle prodding from my father, I got serious about putting safety measures in place. Although the car meets the standards for all the events I have run, it was time for me to take responsibility over my own safety and not rely on the minimums. At first, I struggled to figure out what I would need, how to acquire it, and it took a little while to get everything in place. I lined up RaceFab Performance to build the rollcage, then I ordered the seat and steering wheel from Summit Racing and called the experts at RaceQuip for the gear I would wear. Check out this article and see if you have some of the same problems, and stick around for parts two and three, where I discuss the items I got and why. New brake pads from PFC Brakes and rotors from DBA USA were ordered up to give the Miata an edge getting into the corners. There is a lot of performance gains to be made with improved braking. How do you think it did? In this latest installment, we discuss our first big change to the Miata: Brakes! After getting some sticky tires, we needed to get it slowed down for the corners without the brakes fading in the late stages of a session as we were seeing, so we turned to PFC Brakes for some of its compound 97 pads and DBA USA for the rotors. To say brakes can make a difference is an understatement, but would we see positive results? Our home track for CrossTime, is Memphis International Raceway, which has a 1.8-mile road course that incorporates the drag strip and shutdown area as the front-straight of the course — that is 3,500 feet. While most cars get there faster, the Miata is approaching 110 mph going into Turn 1, and I’m able to take it through that long sweeper at about 70-75 mph, so the later you can brake there, the better your times are going to be. Additionally, Turns 2 and 3 are flat-out, but Turn 4 is virtually a 90-degree turn that leads into the very tight esses (M’s as they are called in Memphis) of Turns 5 and 6, so if you have good brakes you can make up a ton of time. The installation of rotors and pads is very easy on a Miata and can be done in a matter of two hours, so we concentrated the article more on the results and even include some video on track. So how did it turn out? You’ll have to click the link above to find out, but I’ll tell you I was pleasantly surprised! We’ve made a ton of changes on CrossTime in about the last month: Roll cage, MOMO seat, Joes Racing quick-release steering wheel hub, MOMO steering wheel, RaceQuip harness, Racepak CL1 Vantage, Eibach sway bars, and Bridgestone Potenza RE-71R tires. Would they help? In this update, we talk about our trip to the inaugural SCCA TT Nationals at NCM Park in Bowling Green, Kentucky — our first national event — as well as all the improvements we have made over the past few weeks and months. There will be longer stories on these improvements as the schedule starts to slow down a bit, but we spent a lot of time researching the parts we were going to use on the car. It took some time to get everything ordered and over the last month, we’ve been super busy installing all of them. The TT Nats was the debut for many of the parts I acquired. It certainly affected the car in ways that I wasn’t prepared for and this article goes through my thought processes during the event, while I fought to re-understand the car I had become familiar with over the past few months. The first major change we made were brake pads from PFC Brakes and rotors from DBA USA. We had a cage installed in it by RaceFab Fabrications in Covington, Tennessee, while Summit Racing came to the rescue with a MOMO Super Cup seat and Mod 30 steering wheel as well as a Joes Racing Products quick-release adaptor. We were very excited to receive numerous safety parts from RaceQuip including a seat belt harness (747007), Chevron-5 SFI-1 Racing Suit (available to public early 2019), Nomex underwear and balaclava, arm restraints, Euro Carbon-L SFI3.3 shoes, and 359 Series SFI-5 Outseam Angle Cut Gauntlet Gloves. The last two changes were much needed: Eibach Anti-Roll Kit (front and rear sway bars), and lastly a set of 200 treadwear Bridgestone Potenza RE-71R Summer Performance Tires from Tire Rack, so we didn’t have to compete in the Unlimited class. Check out how the event went for CrossTime HERE. It may not be performance related, but CrossTime received a much needed cover being that is is stored outside. Covercraft provided is with a Noah cover which does the job perfectly! Project CrossTime is being stored outdoors when it isn’t being punished on the racetrack. Living in Memphis, Tennessee means we need something that can protect it against the punishing sun and rain (which can often include hail). The car is not much to look at, so the paint isn’t as much of a concern as the onboard electronics. I already owned a car cover from Covercraft and knew they would have the perfect cover to suit the conditions CrossTime might see in the driveway as well as on the road at events. We go over the myriad of options on choosing a car cover that suits the conditions you are trying to protect against as well as those specific to CrossTime. We walk you through the selection process step-by-step on the website and give you the specs on the cover we ordered and why. We continue through the ordering process, then give you a few tips on care of the cover as well as our impressions of how the cover fits and performs. In a nutshell, we couldn’t be happier with the choice we made. If you are looking for a car cover, check out this article before making your choices for some ideas you may not be thinking about. Here is CrossTime when we purchased it. It had a blown clutch slave cylinder, so we pushed it the length of the driveway and winched it n the trailer. It only took $20 to get it running under its own power! Our first article on CrossTime is really just giving the backstory on the Miata (and a bit about how this came about), but it is a good one to read to see our plans for the car and our timeline for getting each step done. Much will depend on outside factors such as getting parts in on time, and then fitting the installation into our busy schedules. Also, remember we are planning to run the car this year at various events, so we can’t have too much downtime for major overhaul-type installations, unless there is a major failure. Fingers-crossed that won’t rear it’s ugly head, but when you are dealing with a car that is 22 years old with 187,000 miles on the odometer, you might run into some problems. The car was owned by a teacher who had moved to Malaysia to teach English. It had seen some track duty in its past, because we found it had a header and frame connectors. Either the teacher was a weekend autocrosser or a previous owner had been giving it a workout. The engine had the characteristic “tick” from the lifters, something that is a know-issue on Miatas, and a blown slave cylinder for the clutch, but after spending $20 at O’Reilly Auto Parts, we were up and running after about 20 minutes. We had an event in less than a weeks time and were able to secure a rollbar from the NASA director in Memphis. Surprisingly, the car survived the event despite torrential rains from the remnants of a hurricane. We learned a lot at our first event.